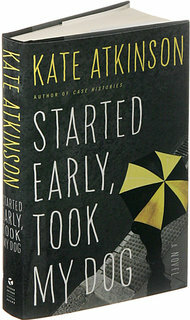 I’ve enjoyed Kate Atkinson’s books for years… her characters are three-dimensional, bad things happen to people you like, life is messy, but through it all, there’s an overall optimism. A bit gritty, but sweet. All true for her latest novel. With Started Early, Took My Dog, Atkinson has two main characters: Jackson Brodie, a sort-of retired PI whom we have seen and enjoyed in previous books, and Tracy Waterhouse, a plumpish, tough-ish 50+ cop on the cusp of retirement. There are a myriad of other characters, as well, and story lines that happen today juxtaposed against those that happen in the 1970s. This mystery is not for skimmers – it requires the reader to read slowly and pay attention. I think that’s great. The New York Times review comments “…Ms. Atkinson (is) a darling of other writers, who understandably admire the wizardry of her techniques.” Guess I’m one of those admirers. Children – having them, caring for them, neglecting them, stealing them, abandoning them, wishing for them, dealing with them, learning from them, loving them – populate the novel, and confusion about the fate of a child from long ago is one of the mysteries unravelled. There’s the small child discovered locked in an apartment with the mother’s weeks-dead body. There’s a child given to the childless couple, who emigrate to Australia. And then there’s the child that Tracy Waterhouse buys outside a shopping mall from a skanky, shiftless low-life woman, well-known to Child Protective Services. Tracy’s story – hiding out, and then on the lam with Courtney – is scary and lovely at the same time, as the reader learns more about Tracy and Tracy learns more about herself and what she is capable of. Brodie’s search involves doggedly following the clues where they lead. And for those who want to know “what about the dog?” I’ll just say that there is a dog and he is a wonderful character in his own right. Brodie’s investigation is richer for having to schlep around a small, smart, and scrappy dog. The dog repays Brodie’s rescue in kind. Very satisfying. Needless to say, Atkinson pulls the plot threads (and a couple more that I’ve ignored in this review) together at the end, in an interesting and satisfactory way. This entry was posted in Commentary, Review and tagged Jackson Brodie, Kate Atkinson, New York Times Book Review, Review, Started Early Took My Dog. Bookmark the permalink.